Sometimes a really very extraordinary thing can look normal. Shabby, even. Like this stone I saw. It set me thinking about King Arthur: a Romano-British chief built almost entirely of smoke, mirrors and folklore. He is believed to have been in existence in the early sixth century, and the romance of the tales of he and his women and his knights endure. They are endlessly fascinating, linked as they are with a time when England was young and beautiful and we all believed in Camelot. That shady character, Thomas Mallory, first printed the tales of this legendary King of England, which are closely allied to ancient French songs. At the very outset of the Arthurian chain of stories, when we stand at the threshold of Arthur’s life, Mallory takes us to London. Because there is a sword stuck fast in a stone, and only a king can shift it. “So in the greatest church of London,” he relates, “whether it were Paul’s or not, the French book maketh no mention….when matins and the first mass was done, there was seen in the churchyard, against the high altar, a great stone four square, like unto a marble stone. I have a radical theory. So in the 900s, before William the Conqueror came along and moved business to the City of London, Kings were rooted at Kingston Upon Thames. Seven Saxon Kings were crowned there. No one can track it back to its inception, though. If we were fantasising, we could look further back to 838AD, when a Great Council was held at Kingston, to define the relationship between the Bishops and the Saxon Kings. And indeed, how far back might this stone’s relationship with this country’s kings go? Is it possible that this stone is the one once fabled to hold a sword, the centre of so many fairy tales which have held men entranced for more than a thousand years? Whatever its provenance – for it has had a chequered history since its glory days – it sits vaingloriously in front of the Kingston Guildhall, surrounded by traffic and local bureaucracy, incredulous at how the mighty can fall. It is on the move again. Soon it will be carefully staged in a Lottery-funded revamp of Kingston’s ancient parish church of All Saints. And once again, they will come from far and wide to gawp at the stone of the Saxon Kings. Nice writeup about this fantastic stone. What a fascinating theory Kate! Had no idea about the existence of this stone. Interesting theory, Kate. Either story is and the photographs are great. … That Edwy! Naugty boy. Didn’t know that about him. Quite. He deserved a rap on the knuckles…I wonder if he got one, Jamie? 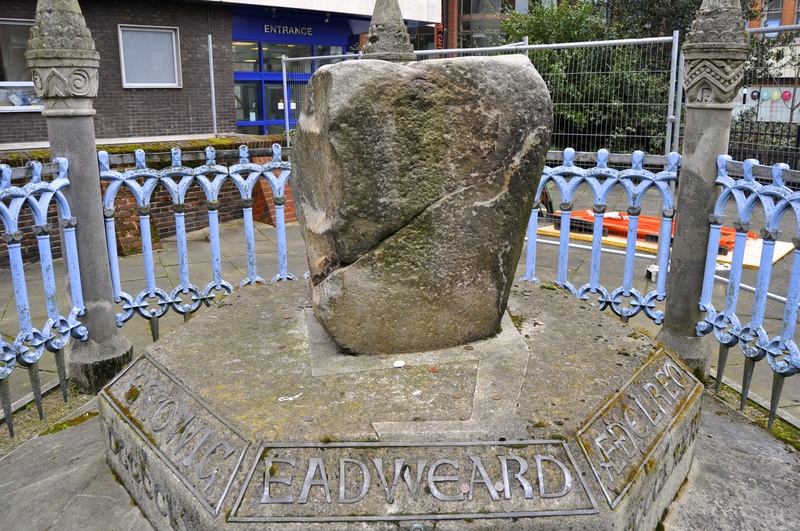 I remember learning about Ethelred in school, The Stone is intriguing and tho much may belong in fantasy there are often sound basis for myths from reality. Makes me wish I could be a fly on the wall of a time machine. I bet the reality of it all is much more intriguing than fantasy could ever make it. Do you know, Chris, I bet you’re right. Once again I find myself yearning for a time machine. I saw the Kingston Stone way back when I was a student, but a possible connection with Arthurian legends had never occurred to me. Of course, it may not be the inspiration for the sword-in-the-stone story (don’t get me started on this!) but it could well be a pointer to how the memes of inauguration rituals may have coalesced in the Arthurian tale. Incidentally, that particular trope emerged in French romances, but similar tales of swords and stones conferring rulership go right back to Greek tales of Theseus and probably beyond. Anyway, a stimulating post, thanks! I’m in total agreement, Chris. The idea of a stone of Kings is a potent idea. One of these days I must try to read the French tales.I saw something recently which showed swords were made with stone moulds so that they really were drawn out of stones. Yes, this is the Bronze Age practice of using stone moulds for weapons. However, I suspect that these may not have been utilitarian weapons (they must have been relatively easy to bend) but designed more for ceremonial purposes such as for votive offerings. However, despite the theory that Arthur’s withdrawal of the sword is in direct line to this practice (a theory espoused by Geoffrey Wainwright, an archaeologist who should know better) there is a lacuna of over two millennia in terms of continuity, and a punning phrase like ‘drawing a sword from a stone’ doesn’t prove to me that Arthur must have been some kind of blacksmith, even when an anvil appears as an element in the medieval tale. I’ve already mentioned Theseus, who found his father’s sword and sandals under a stone, symbolic of his being heir apparent. Other occasions where significant swords conferring status are found sticking out of the ground, under the sand or in a tree or stone are linked with Attila the Hun, the Arabian hero Antar, the Scandinavian hero Sigurd and Galahad from The Quest for the Holy Grail. The key point is that the assumption of the sword recognises status, just as taking up the sceptre does in the Saxon ceremony. The stone, especially when treated as a throne, I propose represents chthonic approval of the rightness of that conferring of power, which makes the inauguration stone at Kingston such a potent symbol, all the more so for having survived for all those centuries. Not at all! Wonderful to have a bit of in-depth light shone on the subject, Chris. Makes me eager to go back and take another look. And you have taught me a new word. I have pounced on it, I confess. Chthonic- pertaining to the underworld, I think? The idea that the stone makes that link between what is beneath, what is supernatural, and the power of the stone: it’s such a wonderful idea. Thank you. ah, if only stones could speak! The tales they would share, of pride and arrogance, of hope and innocence. But, rather they sit silent, listening to us as we rant and rave, dream and weave. Indeed, Joss. Just think of all the stories we walk over in a cathedral, or an old city pavement! I often sense that when walking on old stones. When I was in Bath, a few years ago, I remember thinking “centuries ago, another woman stood here, with her dreams, her pain, her daily chores”. Thanks, Kate, for trying to unravel the mystery of this legend. May it be rooted in reality, and not fantasy. Now, where is the famed sword? Ooooh, Judy, I’d love to stumble on that as I wondered round some town or other! has it been worn smooth by magic or by hands over the centuries? Probably a bit of both, Sidey. It begs the question as to whether Saxon kings had enchanted bottoms. One of my favorite Disney films as a kid . . . The Sword in the Stone with Merlin, Arthur (nicknamed Newt), Archimedes (the owl). Thank you, Nancy! I loved that film to. The duel scene above all others. I could get very excited about your theory, Kate. I’d have to ask “why not?” rather than dismiss it as impossible. The Arthurian cycle is magical, although I am probably more familiar with snippets from Tennyson than Malory. I really enjoyed reading this and getting caught up in imagining. Since I was a child, I have continued to be fascinated by My King Arthur and his knights of the round-table, the sorcerer Merlin and all the tales and legends surrounding them. Recently, I was delighted to see pictures of Camelot in another post.Your theory of the Stone and the sword seems plausible.Any idea what happened to the famed round table? Shakti, there is a famous Round Table hanging on a wall in Winchester, painted in Tudor times with an image of King Arthur looking suspiciously like a young Henry VIII (just google images for ‘Winchester Round Table’). Another ‘Round Table’ was a circular wooden building built in the 14th century in the grounds of Windsor Castle and partially excavated by Time Team (link here: http://www.channel4.com/programmes/time-team-specials/episode-guide/series-119/episode-1). Unfortunately, there’s nothing to see above ground now. The idea of a round table, I should add, first appeared in the 12th century, perhaps inspired by contemporary Breton ideas rather than representing an ancient tradition. Thank you Kate, this is indeed interesting. I passed through Winchester earlier in the month and had an interesting meeting about which I might write a post! It’s calmgrove, actually, but no matter! 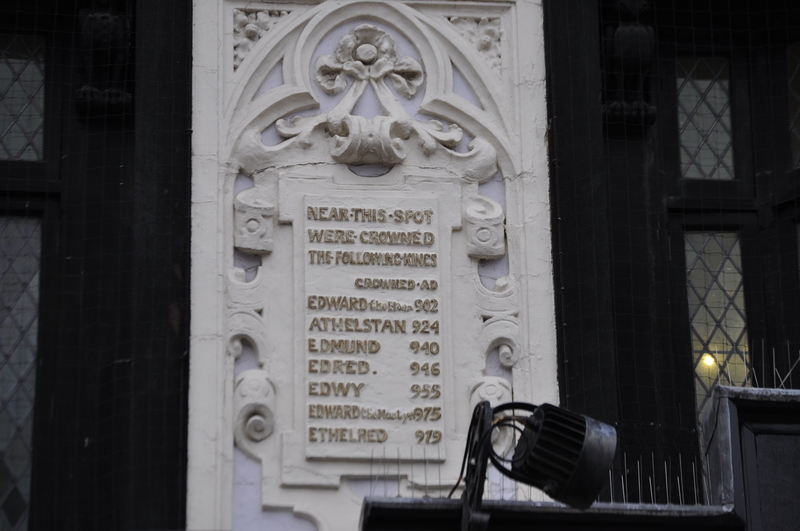 Shame you missed the Round Table on your passage through Winchester; another time maybe? Interesting theory- saving it for later so that I can see the slides how on a different device. And theory it must remain, Tammy, I think 🙂 Unless you discover something on closer examination! FBA, you are right. Such a solid symbol. Shame it has been alowed to sit outside the council offices for so long: but it’s about to go to a new home in the old church. how exciting! Please do document the move if you end up being so lucky to witness it! you tell great tales Kate. I love the King Arthur stories and would like to think this is THE stone that held the sword… Otherwise why all the fuss over a stone? And why are they moving it? Hi Rosie! It’s thought to be the stone used in seven Saxon coronations, we just don’t know how much farther back it goes. Clearly a king-stone is a potent symbol in folklore as well as fact! If you have a moment do read Calmgrove’s comments – they shed all sorts of light on the mythology surrounding swords found in strange places. In a fit of research for some off-the-blog writing, I came across some interesting stories about the Viking sagas. The sagas mentioned trips to North America, placing them as far south as present New York State a thousand years ago. But it took archaeology to prove it. I have always viewed Arthur similarly. It would be so cool if those tales could be proven true. I loved this post, Kate. It puts me in mind of Plimoth/Plymouth rock. School children in New England are spun epic tales of the pilgrims landing there to begin their life of freedom! And then? it’s a rock. In a gazebo. By the ocean. At the very least, yours has cool carvings around it and a massive legend to go with its history. Why dogs don’t feel cheated.